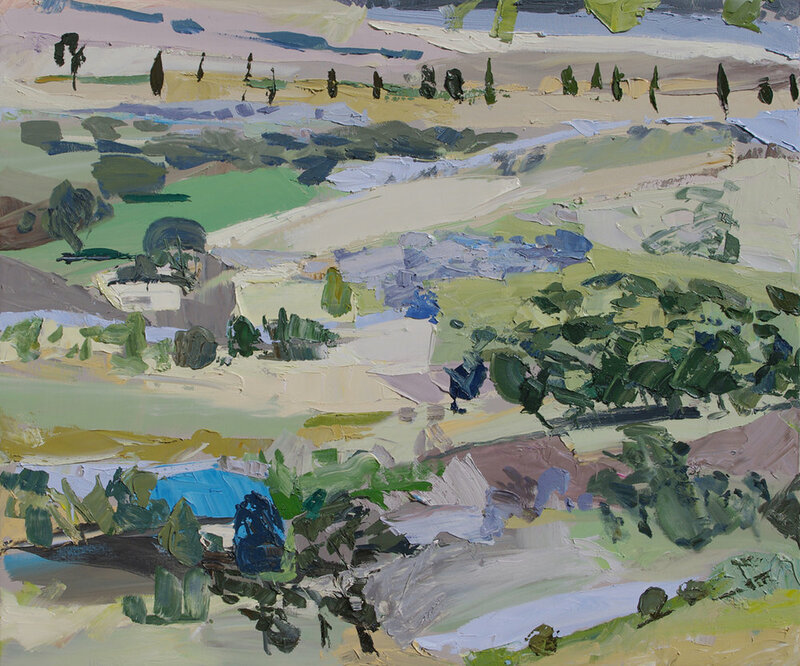 My art practice encompasses a diverse range of subjects, but I am best known for my abstract landscapes, a series inspired by the colours, contrasting light and broad shapes of the South Australian agricultural landscape. These paintings investigate the temporal experience of viewing the landscape. The progress of the seasons and the agricultural processes on the land create a series of transient views. The paintings portray the movement of light over land, the cycle of growth in plants and soil, the flamboyant persistence of roadside weeds. The textures, colours and patterns, undergoing daily changes. The shifting nature is heightened by the experience of driving, moving through the view, watching shapes shift with changing perspective. During the painting process, grasses or branches become gestures, roads are made into formal borders between shapes, skies are fragmented and used as tonal intrusions. Relationships between landscape elements are shifted as happens when the viewer moves through the landscape. When produced in this way, the paintings become landscape journeys exploring the passage of time. In addition to these lyrical abstract landscapes I have been developing a range of abstracted interiors, made with a collage methodology. 2018 Finalist Bluethumb Art Prize, Melbourne, Vic. 2017 Finalist Hadleys Art Prize, Hobart, Tas. 2016 Exhibition Little Boxes, Adelaide Town Hall, SA. 2015 Finalist Muswellbrook Art Prize, Muswellbrook, NSW. 2015 Imago Mundi, international touring exhibition, curated by Benneton Foundation. 2014 Exhibition Back Roads, Hahndorf Academy, SA. 2013 Winner City of Burnside Art Prize, SA. 2013 Winner Watershed Art Prize, SA. 2011 Exhibition The Road to Here, Barossa Regional Gallery, Tanunda, SA. 2011 Winner Barossa Art Prize, SA. 2010 Director’s Choice, Greenhill Galleries @ the Hilton Hotel, Adelaide, SA. Frequent finalist Whyalla Art Prize, Whyalla, SA. Frequent finalist Fleurieu Peninsula Biennale, Fleurieu Vistas Prize, McLaren Vale, SA. 2005 Winner Heysen Prize for Australian Landscape, Hahndorf Academy, SA.